Foreign buyers purchased $153 billion of U.S. residential property in April 2016 — March 2017, an increase from the $102.6 billion of property purchased in the previous 12-month period. This accounts for 10 percent of the dollar volume of existing home sales. Non-resident foreign buyers purchased $78.1 billion of property, while resident foreign buyers purchased $74.9 billion of property. Foreign buyers purchased 284,455 residential properties, an increase from the 214,885 properties purchased during the previous 12-month period. This accounts for five percent of existing home sales. Non-resident foreign buyers accounted for two percent of existing home sales and resident foreign buyers accounted for three percent of existing home sales. Foreign buyers who primarily reside outside the United States (non-resident) accounted for 42 percent of all foreign buyers, and recent immigrants and foreign buyers who reside in the United States on work, student,or other visas (resident) accounted for 58 percent. This composition is about the same as that of the previous 12-month period. Before 2016, the ratio of resident to non-resident foreign buyers was typically closer to 50-50. Asia and Oceania accounted for 35 percent of foreign buyers of residential properties,followed by Latin America and the Caribbean at 24 percent, Europe at 16 percent, North America(Canada) at 12 percent, and Africa at four percent. Nine percent of foreign buyers came from a region that the survey respondent could not identify. Foreign buyers from five countries continued to account for most of the reported purchases:China (14 percent), Canada (12 percent), Mexico (10 percent), India (5 percent), and the United Kingdom (5 percent). Together, they constituted 46 percent of the number of foreign residential property buyers compared to 45 percent in the previous 12-month period. The number of REALTORS® who are new to the business has been increasing, a positive indicator of the health of the U.S. real estate market. Approximately 17 percent reported that they have been in the business less than one year, up from less than one percent of respondents in 2010 when the housing market was in a slump. Serving international clients requires specialized knowledge on the part of the REALTOR®relating to immigration, tax, property, financing, and other regulations. Cultural affinity and knowledge of client preferences also play an important role in nurturing relationships with international clients. 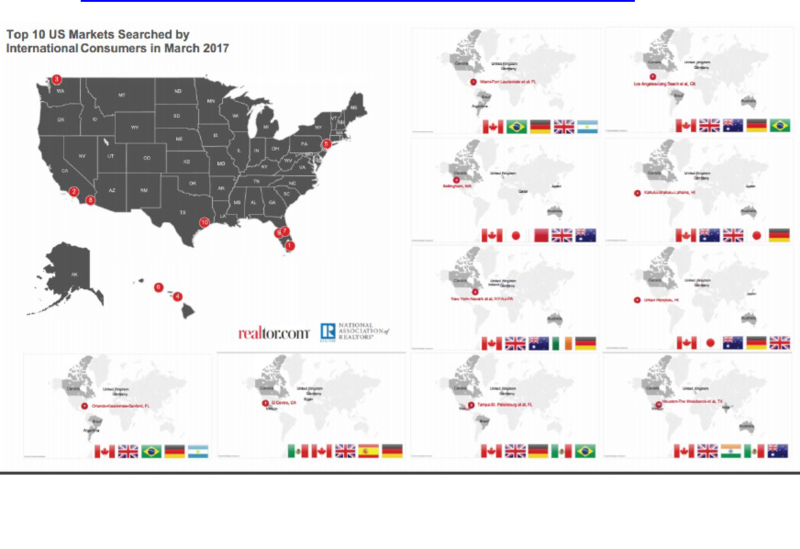 With more REALTORS® new to the business, there is a need for education and training of new members in dealing with international clients, particularly non-resident foreign buyers who are likely to face greater challenges and are less familiar with the U.S. housing market than are resident foreign buyers. NAR offers valuable educational training and resources for agents who are looking at expanding their business transactions with international clients.